18 Tips to improve Radically Your Social Media Marketing! A successful Social Media Marketing Strategy means having a well thought out plan that guides you in everything from attracting users to engaging fans and followers to organizing and researching, with the ultimate goal of converting your followers into paying customers. On top of that, it’s necessary to stay on top of the constant changes that accompany the nature of social media and adapt your strategy accordingly. Today we’re going to give you 18 Tips to Improve Your Social Media Marketing Strategy to help your business reach its goals. Whether you’re putting together your strategy for the first time or you’re looking for ways to spice up your existing strategy, today’s post will present you with new ideas for getting the attention of users, interacting with them, organizing your social media efforts, and taking advantage of recent trends online. 1) Take advantage of your Blog! Blogging is an excellent way to enhance your social media efforts. For starters, if you share your blog posts in status updates, you’ll have a high chance of bringing people back to your website. Furthermore, you can demonstrate your company’s knowledge in your industry and boost brand exposure by sharing your content to a relevant and targeted audience. Blogging is also a great platform for mentioning other people, businesses, and apps, which will hopefully lead to them to share your content and mention you as well. Remember to include social sharing buttons on your blog to encourage readers to share it effortlessly on their social media of choice. Check out these scientifically proven tips for creating the “perfect” blog post. Repurposing content is not only a great way to save time but also very effective for expanding your reach, if done in the right way. Think about it, constantly creating content for the same group of readers is not going to help you expand your audience considerably. 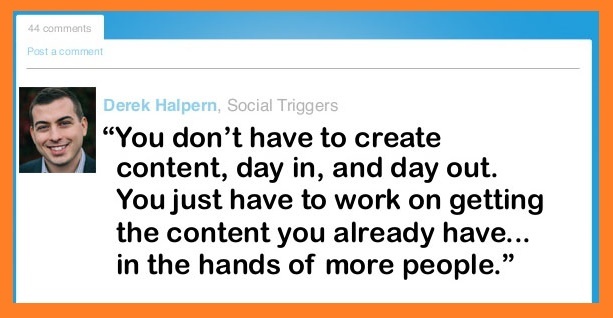 What IS necessary, is getting your already valuable content to reach MORE people. One of the keys to social media marketing is focusing on: High Quality Content + Multiple Formats + Wide Online Distribution. Some experts actually recommend spending 20% of your time creating content and 80% of your time distributing it. Wondering how? For starters, try picking out key elements from your previous content, and reposting them with a link back to the original article. In addition to re-sharing your quality content on Facebook, Twitter, etc. you should also try adapting your content in a number of different ways. For example, change your articles visually and reshare them on platforms like Slideshare. 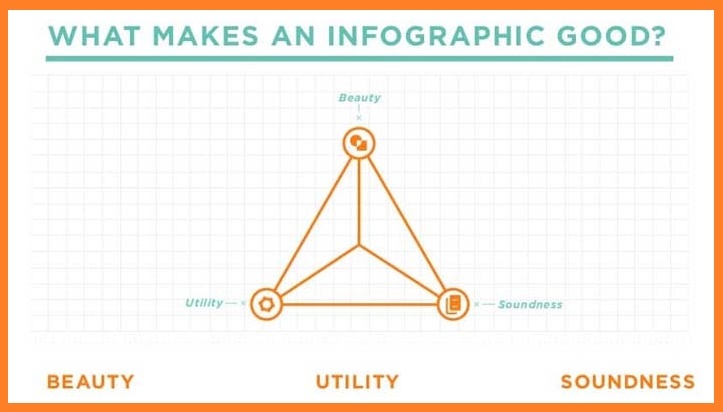 Make infographics or quotes out your material and share them on sites like Instagram. Or even use your old content to create pdf reports, or an email/newsletter series. You can also try making Youtube videos and hosting Webinars. The idea is to get your ideas on as many different platforms as possible with the hopes of attracting new users who find your content valuable. 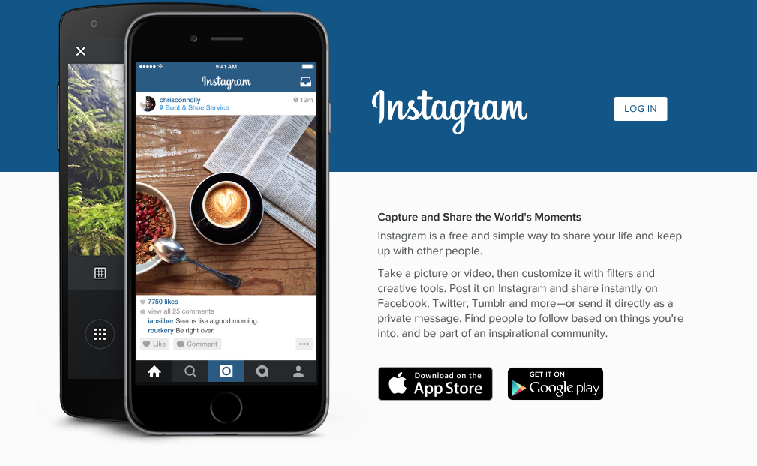 Images are extremely important for social media marketing. Consider this, articles with images get 94% more total views. However, as you probably know from experience, creating and editing images can end up taking more time than you expected. Well, you’re in luck! 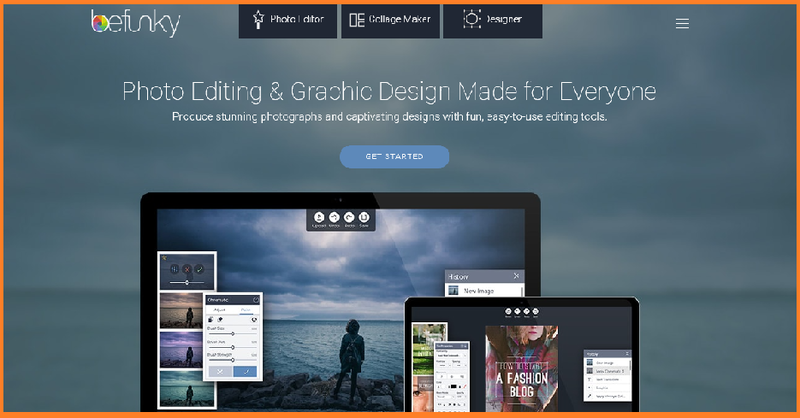 Check out sites like PicMonkey, BeFunky, or Timeline Slicer (especially for creating cover photos for Facebook). 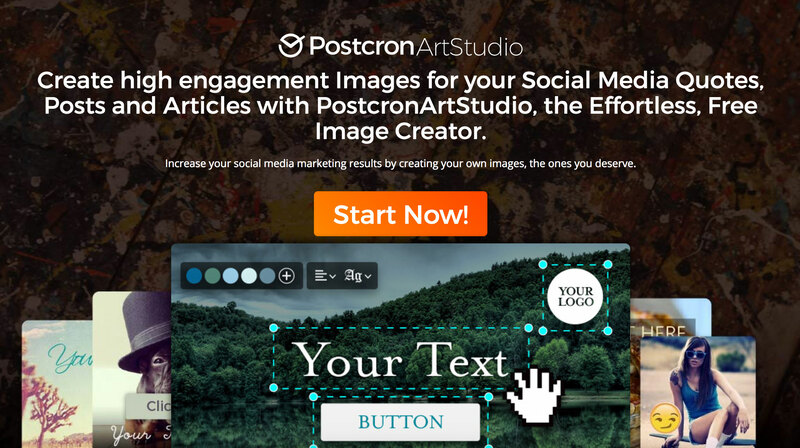 If you like creating pictures with quotes, here are some tools to check out: ArtStudio, Usechisel, or Quotescover. 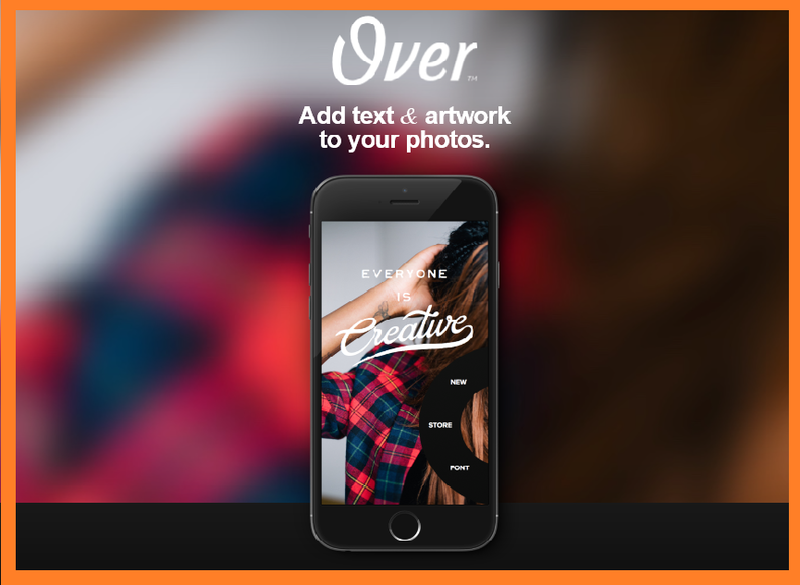 If you want to create photos on the go try apps like Pictapgo or Over. Marketing and communication are extremely visual based these days, that’s why incorporating audio into your marketing strategy is a great way to stand out and connect with your audience on a personal level. Sound affects our bodies, thoughts, and actions and has a different way of reaching people compared to media that appeals to other senses. Here are some ways that you can include audio in your social media marketing strategy: First of all, Twitter lets you audio-tweet beyond the 140 character limit, so start taking advantage of that. Or, you could try recording client testimonials, greeting visitors with an audio message from the CEO, recording blog posts for those who prefer Podcasts, when quoting someone include their actual audio quote, or even play appealing background music on your site to keep users there longer (Be careful here! Sound can also have a negative effect, so make sure disabling all audio is an option). All of these are great ideas for breaking through today’s visual clutter and giving your brand a personal touch. Are you carrying out your social media marketing strategy as efficiently as possible? 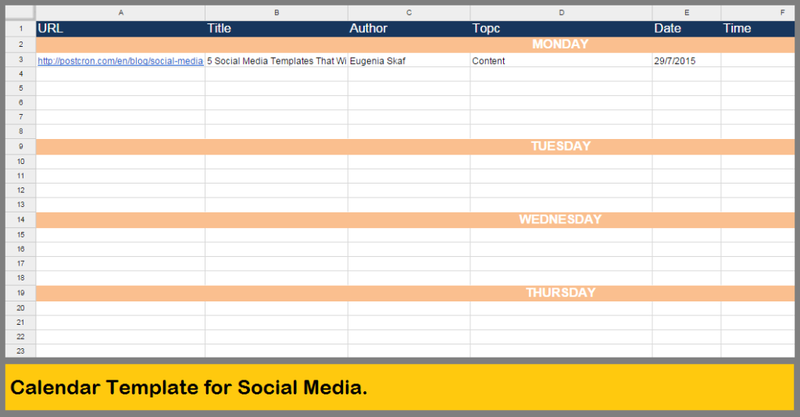 Working with Content Calendars for Social Media are extremely helpful when it comes to organizing all of the content you want to generate and publish. 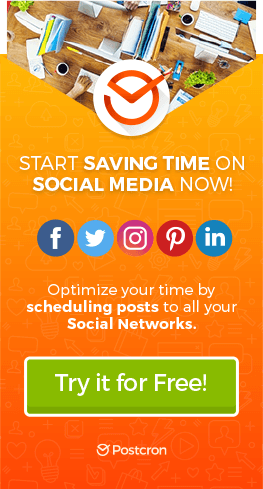 They allow you to get ahead on work and start scheduling your posts ahead of time. Another advantage of organizing your content in this way is that you can include evaluations of your previous posts’ performance to help you plan your promotional campaigns with greater efficiency. Content Calendars and spreadsheets in general are fundamental tools for Community Managers. 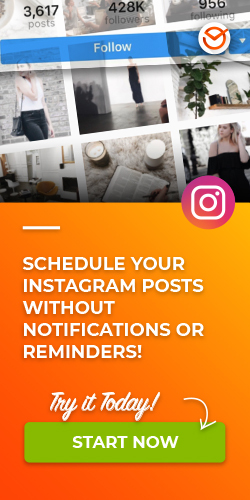 If you want to increase the effectiveness of your promotional efforts on social networks check out more time-saving templates. 7) Keep up with Millennials, They were born with Social Media Marketing! Marketers can learn a whole lot from millennials, and moreover, businesses that can’t keep up with this generation could be missing out on a huge market. They have grown up with technology at their fingertips (in their hands actually), are constantly connected via social media, want information now, they are good at multitasking, and above all, have different values than previous generations. Brands need to recognize how these differences can affect Marketing strategies. 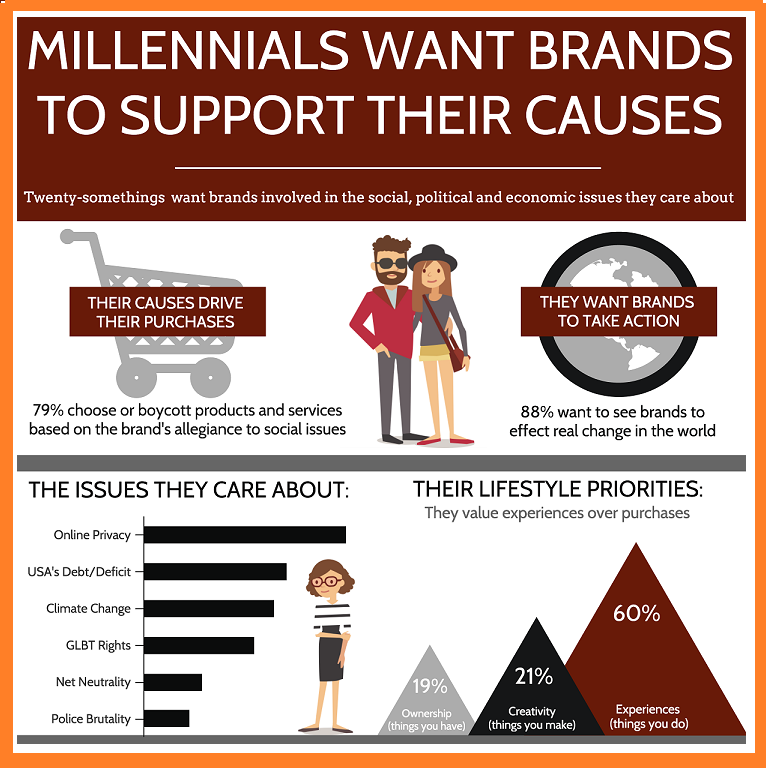 For example, Millennials are much more likely to choose (or switch to) a brand based on a cause they care about. Also, Millenials don’t mindlessly absorb advertisements, they want to be involved in the discussion – they tell brands what they want and expect a response. They want mobile friendly, visually clear, and easy to understand products and services. Get to know the expectations and behaviors of Millennials, and incorporate them into your social media marketing strategies. A picture says a thousand words. While articles and links are obviously important for driving traffic to your site, they are best not left alone. The impact that visual content has on audiences is the drive to get users to click. Sites like Tumblr, Exposure, and Instagram are all image based. Microblogging is a great way to share your story quickly and simply. Want your customers to feel loyal to your company and keep coming back? Try giving them a little something extra – we’re talking about added value. Added value is all about giving the customer what they really want or are looking for. It can be as simple as offering free webinars, advice on how to use a product or service more effectively, free consultations, discounts for returning clients or referrals to another customer, etc. Don’t forget the importance of doing effective marketing research to find out what your customers actually want and what will make a difference to them. Added value will help you gain customer confidence and separate you from the pack. As we’ve been saying, engaging prospects is extremely important in today’s social media marketing. You need to find out where your potential clients are ‘hanging out’ on social media and start reading, listening, and commenting when you have something to add. This not only will increase brand awareness but also give a personable feel to your business. 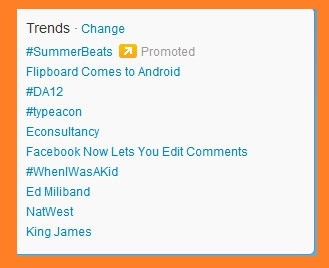 On Twitter, you can see which topics are being talked about the most by checking out ‘Trends’. Since organic reach is on the decline, more and more businesses are turning to paid ads on social media sites. Facebook ads are probably the biggest player, but they’re not the only one. Consider advertising on other social media platforms like LinkedIn and Instagram, even Twitter and SnapChat are developing a new ad products. The important thing to remember for your social media strategy is to analyze different platforms, pros and cons, price differences, potential reach, formats, and targeting options. If your marketing team isn’t huge or it’s just you in charge, responding to and answering all of your customer’s questions can get tricky and unfortunately, delayed. 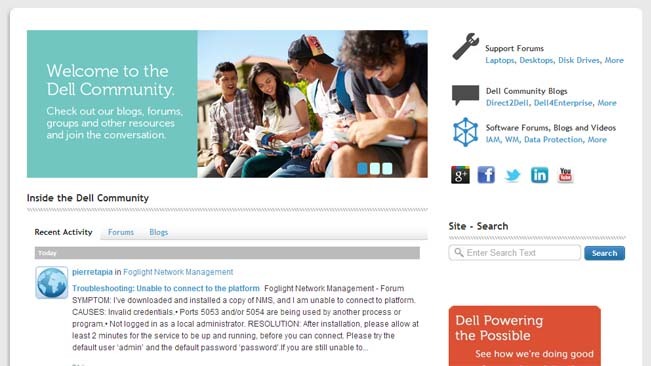 If appropriate for you business, you can consider creating a group, forum, or an online community, so that experienced clients can provide product support and attention for new users. Don’t worry, support communities can be moderated and led by yourself, specialists, or technicians from the company. Online communities also serve to give clients a “sense of belonging” and they generate a space for super valuable conversations that fan pages don’t really allow for. Take advantage of the collaborative nature of the community, where the participants themselves provide answers and help other users. While it would be nice if all our users would just willingly and joyously fill out our surveys and take our usability tests, that’s usually not the case. As you know, getting real feedback for your product or service is extremely important. So why not give your users a reason to help you out? 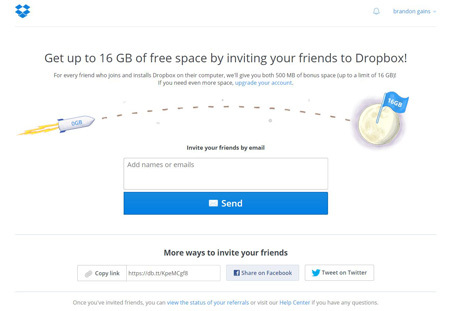 You can try offering your customers incentives for providing feedback. Just make sure the reward fits in with your business model, and what is actually appealing to your customers. A great idea is to offer discounts, coupons or chances to enter in giveaways. Test out different offers and see what works and build an incentive program around that. Now those slide shows that your team worked so hard don’t have to be discarded and forgotten. Slide shows uploaded to SlideShare can then be used in productive ways, they can be presented at your at staff meetings, or you can share them on your social network of choice, include them in your blog, and even email them to your contacts. 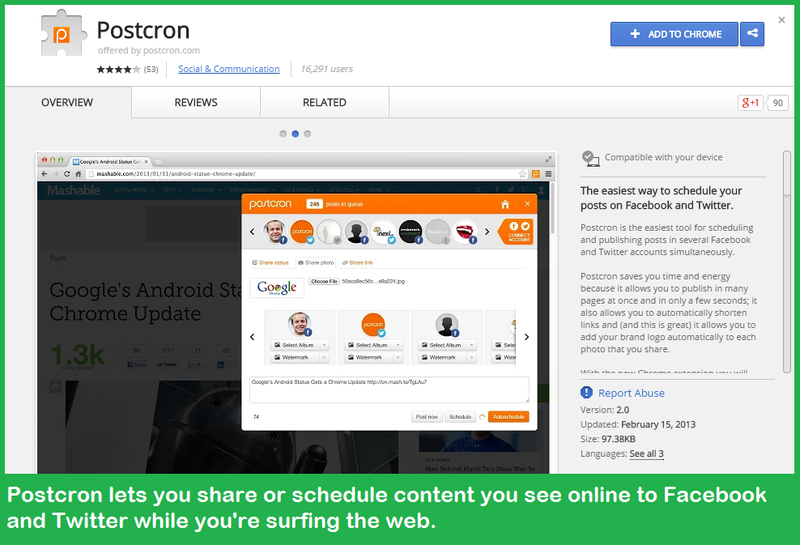 If you’re a Chrome user, you’ll be happy to know that Postcron has launched its Chrome extension, and scheduling posts has become that much easier. It allows you to get all of your scheduling done right from the browser and skip logging in. Share updates, pictures, videos, links to Facebook, Twitter, and Google+ all at once and in advance, without having to log into each site individually. What consumers are saying about you is a huge influencer when it’s comes to getting new customers. Be sure you are checking review websites that pertain to your business like TripAdvisor, Yelp, Google+ ‘Local’, etc. Don’t be afraid to ask customers to leave you reviews. But, make sure you respond. Your response will give potential customers a good idea of who you are what you’re business is all about. 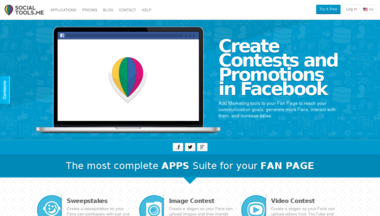 Organizing Contests on Facebook is a great way to engage with users and entertain them at the same time! Users can end up spending hours in front of their computers, playing and engaging with your brand. Create image or video contests, or be present with sweepstakes during important parts of the year like Mother’s Day or Christmas. 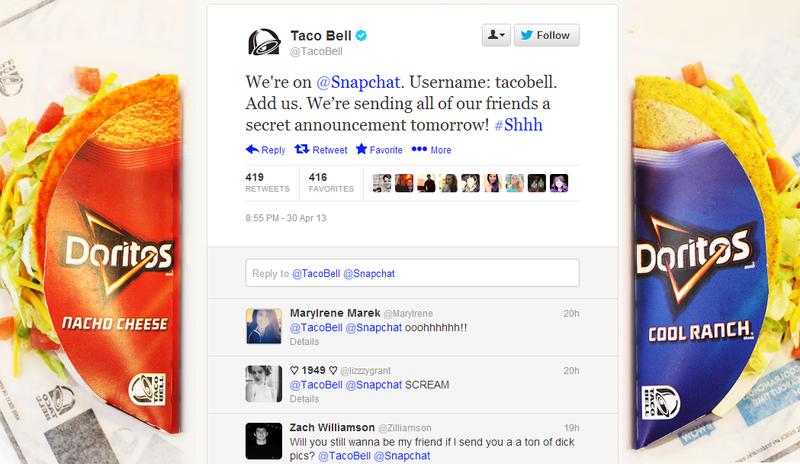 This will humanize your brand and help users associate you with happy times. My last (and favorite) tip is inspired by the fact that Social Media is constantly evolving. So, as marketers, it’s not only important to be on top of new trends, but we must also be constantly learning and mastering new skills. A great way to do that is by following influential social media marketing blogs. They not only keep us up to date with the latest trends, but point out helpful tools and apps, give us tips, tutorials, secrets, and so on. Check out blogs like Hupspot’s marketing blog, Postcron’s blog, or Kissmetrics. to stay on top of your game! There are many many ways to help your business stand out in social media and make an impact on your followers. 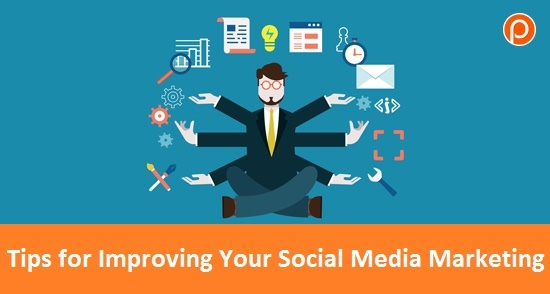 Hopefully you found some new ideas in this post that will help you improve your social media efforts.